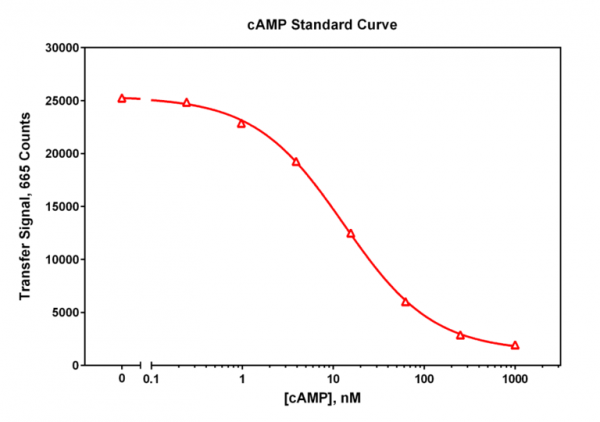 Product information "Cyclic AMP TR-FRET Kit"
The TR-FRET cAMP Assay is designed to allow the user to detect and quantitatively measure the amount of cyclic AMP (cAMP) present in cell based assay systems. A europium (Eu) labeled monoclonal anti-cAMP antibody (Donor) is paired with a fluorescently labeled cAMP analog (Acceptor), and in the absence of any endogenous cAMP, will produce a time-resolved energy transfer signal at 665 nm when excited at 340 nm. If cAMP accumulates in the well due to the activation of cellular adenylyl cyclase, this cAMP inhibits the formation of the labeled Donor/Acceptor complex, decreasing the amount of energy transfer signal produced, with the overall drop in signal being inversely proportional to the amount of cAMP accumulated. Customer review for "Cyclic AMP TR-FRET Kit"